For many people, it’s important to stick with the basics, and there’s absolutely nothing wrong with that. 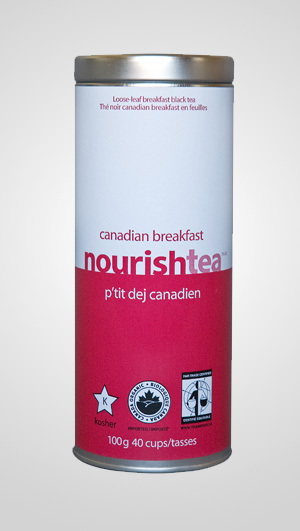 nourishtea’s canadian breakfast is our very own spin on the traditional Orange Pekoe, and a first grade tea from the steep mountains of Sri Lanka. It’s a warm, full-bodied brew, with a smooth malty richness to invigorate you in the morning, and quite simply one of the best breakfast teas available. Wake up friends, to something easy to drink and very familiar to the pallet. Start your day with a cup of our canadian breakfast (it quite simply goes wonderfully with anything on your plate: from a stack of fluffy pancakes to a flaky croissant with preserves).